This page is where you will find our Nigerian dwarf kids for sale. To avoid misunderstandings and disappointment, please read the following information before reserving a kid. Doelings out of first fresheners are sold at $350. After a doe’s first freshening, pricing may go up or may stay at $350, depending on our evaluation of the doe’s mammaries, milk production, and show quality. Bucklings are available only out of does who have good production, good mammaries and are easy to milk; otherwise, they are wethered and sold as pets for $100 each. Bucks out of first fresheners are almost always wethered because the dam has not had the time to prove herself in the first month after her first kids are born. We will not sell a buck as a buck unless we would be willing to use him in our own breeding program, which is why we castrate most bucklings and sell them as pets. Almost all of our kids are dam raised. It is against our philosophy to take babies away from their mothers and raise them on a bottle, unless there is some extraordinary circumstance. For years that meant things like a premature birth, hypothermia, dam rejecting baby, etc. These types of situations are truly extraordinary, as one of the things we like about Nigerians is their excellent mothering ability. However, in recent years, we have had more does giving birth to quadruplets and quintuplets and even first fresheners giving birth to triplets or more. 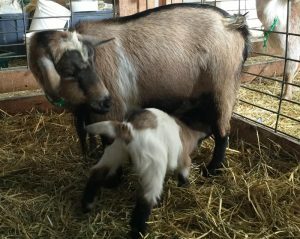 Because goats only have two teats, and younger does don’t produce as much as older does, we may also bottle-feed kids if we are concerned that they may not get enough milk while being raised on mom. So we do have a varying number of bottle babies available each year, usually somewhere between two and five annually. We realize that some people believe goats must be bottle-fed if you want friendly goats; however, we disagree. Our herd includes both dam-raised and bottle-fed adults, and you can’t tell them apart based on their personalities. If you want friendly goats, you need to spend time with them, and if you don’t have time to spend with them, then you shouldn’t be getting them in the first place. Dam-raised kids can go to their new homes when they weigh 20 pounds, but NO earlier than two months of age. We will be happy to keep them here until they are three months old because we feel strongly that they will be healthier if they get their dam’s milk for a longer period of time. Bottle-raised kids can only go to their new home earlier than that if the new owner will have goat milk available to feed them. All breeding quality animals are sold with registration papers or with a registration application with AGS and ADGA. They can also be registered with NDGA. Our tattoo sequence is registered with all three registries. We will not knowingly sell any animal with papers if it has a serious fault or disqualification. We cannot guarantee mature height on a kid, but none of our goats are over the maximum height. All goats are disbudded or polled (hornless), which is required for showing. Because horned and hornless goats should not be raised together, you need to contact us before kids are born if you have a horned herd and need horned kids. Like most serious goat breeders, we name our registered kids based upon a pattern or system. People have all sorts of systems, but in our case, each doe has a theme. For example, Carmen was named after the opera, and all of her babies were named after opera characters. Carmen got her name because her mother, Dancy, had a musical theme, so all of her babies were named after something musical. One of Carmen’s daughters was Lizzie Borden — yes, there was an opera about Lizzie Borden. Lizzie’s babies are named after outlaws. One of her daughters was Bonnie Parker, and Bonnie’s babies followed a Great Depression theme. Get the idea? Why do we do this? To keep everyone straight! People are always commenting on how they don’t know how I can keep all the names and pedigrees straight on nearly 30 goats. Well, I wouldn’t if I didn’t have some sort of system. Not only can I keep straight who’s who on the farm, but I will also recognize names of goats that are sold. So, if someday I see one of my goats on a show list or a milk test list, I’ll immediately know who the parents were just by looking at the name. Of course, you can call your goat whatever you want. We have bought a few goats that had such odd names, we just couldn’t bring ourselves to call them that — like Thrill and Hot Rod. If you feel strongly about a goat’s name, please be sure to inform us when you first contact us. We are always happy to have help coming up with names, and we’ve been very happy with some of the names that buyers have selected. If you’d like to help name your goat, just let us know, and we’ll tell you what the dam’s theme is, and you can do all the research to find a suitable name. If you want testing performed prior to purchasing an animal, please let us know when you first contact us, because testing may take as long as three weeks to accomplish, depending upon the vet’s and the lab’s schedule. You are responsible for all costs associated with testing, and prices will start around $100 for one test. All of our goats tested negative for CAE, CL, and Johnes in 2009, and we have had a closed herd since 2008. We have not added any outside does to our herd since 2005. We again had all does tested in 2013 for CAE, and all were negative. Illinois is a certified TB-free and brucellosis-free state. We take our goats’ health very seriously as they are our primary dairy source. If you are interested in buying a kid, a reservation deposit of $100 is required. The deposit is non-refundable unless we are unable to provide you with the specific kid you wanted, such as specific gender or breeding. I do not take deposits based upon color of hair or eyes. Many kids are sold before they even hit the ground, so if you have your heart set on a particular breeding, it is best to put down a deposit, so you are not disappointed if someone else buys the kid. Reservations are filled in the order that deposits are received, and we often have multiple reservations on individual breedings. I will take up to two reservations on a first freshener and up to three reservations on senior does. A reservation is not a guarantee that you will get a kid from a specific breeding because we have no control over how many bucks and does are produced from a specific breeding. For example, if you have the second doe reservation on a specific breeding, and the goat only has one doe, we will not be able to fulfill your request. In that case, you can move your deposit to a different goat, or we can give you a refund. We reserve the right to retain any kid in our herd, and if you do not have a second choice, we will provide a refund. We have only done this once in the years we’ve been raising goats, so it is certainly not something to worry about under normal circumstances, but it is something to be aware of. Under normal circumstances, I decide at breeding which kids I will be retaining each year; however, in 2011, we had our first c-section, and I felt a need to retain the two surviving kids that were born, because the dam was one of our best milkers, she was seven years old, and we had only retained one doe from her so far. We are located in Illinois. For information about shipping, out-of-state travel, and health certificates, visit our For Sale page. To learn more about each dam and sire, click on his or her name. Due dates are calculated at 145 days, and almost all of our goats give birth between 145 and 150 days, so the due date you see listed is usually the earliest a doe is expected to kid. Additional goats will be added for fall kidding. ‡ Bucks out of first fresheners are only available as wethers (castrated) for $100 each.